When I was a child, my favourite animals were tortoises. I was completely obsessed with them and went crazy over anything faintly tortoise or turtle related. All my soft toys were tortoises or turtles. Indeed, I had an entire family of stuffed toy tortoises, all of different design, gathered during my years as a toddler. There was the gigantic patchwork Papa Tort, the smaller yet still bulky bright red Mama Tort whom I won in a school raffle (organised by my mother and about which I’ve always been deeply suspicious), the less attractive and rather tatty Uncle Tort, and two younger tortoises, one named ‘Tootaloo’ – according to his label – and then, finally, Baby Tort. Together these formed the core of what my brother and I called the “Favourites” – in other words, soft toys. My brother, on the other hand, was utterly obsessed with bears. He began with two excellent teddy bears, for which my mother used to knit jumpers, and then moved on to actual bears. Soft toy bears, that is, as we had two dogs and a cat and thus not enough room for a pet bear into the bargain. I’ll never forget his terrible sense of loss when one day our dog Poppy ate the bear my mother had brought him from Bern in Switzerland. It was made with real fur and to this day I shudder to think that perhaps it was made from bear fur, but am sure it must have been some other unfortunate animal who lost his hide. My brother’s discovery of the torn, slobbery remains sent a spear through his heart, and I hope that he has, after thirty odd years, recovered at last. My tortoise obsession was such that I would almost certainly cry if anyone, in anyway, maligned tortoises. I remember my mother once told me what seems, in retrospect, a rather bad joke, but it went something along the lines of a Tortoise being sent to prison for “sticking his neck out.” On hearing this, and being of an age where it was difficult to divorce metaphor and wordplay from reality, I was utterly devastated and asked for days afterwards if that tortoise would be alright. Despite my mother’s reassurances that in fact she’d made the whole thing up, I never quite believed her and thought she was telling me this to stop me worrying about that poor tortoise in prison. My tortoise collection never extended to the real thing sadly, so I had to make do with every other available manifestation of tortoises. One such was a number of small ceramic tortoises made for fish tanks. One day, I dropped one of these on the road whilst waiting at the bus stop, just as the bus was pulling into the kerb. I was saved from certain death by my mother, who restrained me as I tried to save the poor little tortoise. Unfortunately, the bus’s aim was good and after a pathetic crunching sound, all that was left was a pile of green-tinted dust. Another of these ceramic tortoises was given by me to my father to take overseas on assignments. As a foreign correspondent who was often in warzones, or doing something ridiculously heroic like sailing around Cape Horn, we had cause to worry for his wellbeing, and naturally I thought a tortoise good luck charm would help. The great thing is that it did help, and my father managed to come back in one piece every time. So, for that matter, did the tortoise, and my father still keeps him as a travelling good luck charm. This obsession with tortoises has stood the test of time and I retain my fondness for these curious, long-lived and fantastically ancient creatures. Yet, in my adulthood, I have come to take on a greater variety of animal totems who have, in soft-toy form, proved wonderful travel companions. 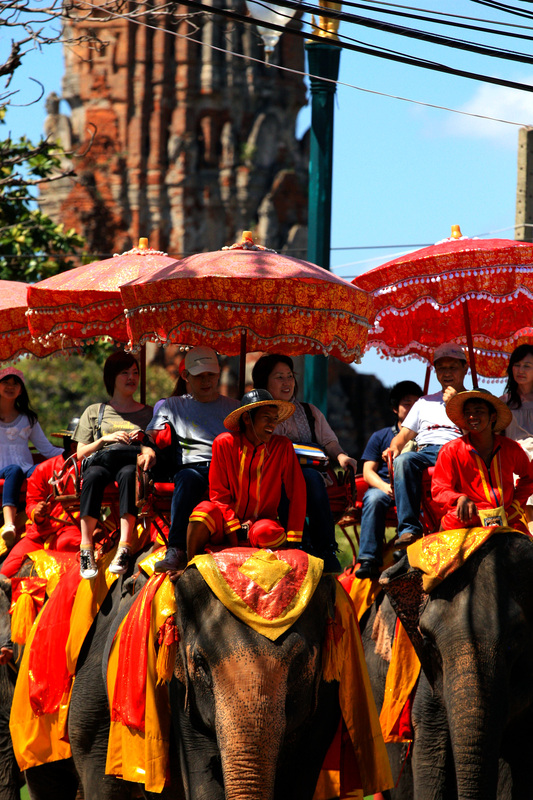 These include platypuses, bilbies, rabbits and, of course, elephants. 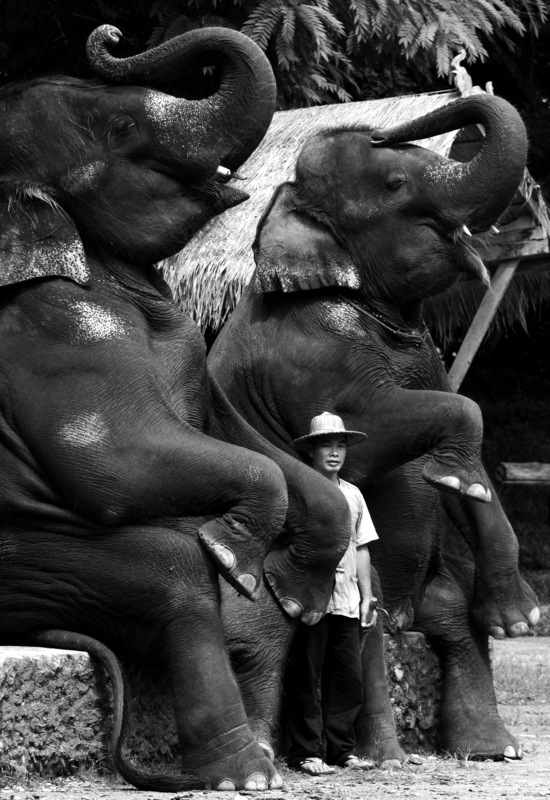 My love of elephants also began during childhood, when I first saw these magnificent beasts at Sydney’s Taronga Zoo. For a kid who, like every other kid on the planet, was totally obsessed with dinosaurs, the elephant seemed to be the nearest approximation to the lumbering beasts that filled the pages of my many dinosaur books. Watching the shuddering flanks of the elephants as they, admittedly forlornly, drifted around the then unimpressive compound gave me my first sense of what a dinosaur must have been like. Yet elephants were no mere second-rate sop for a real sauropod – rather, they were, in themselves, magnificent and curious creatures, with possible the most exciting appendage in the animal world. I had not yet seen the star-nosed mole, which, considering the appallingly lurid nature of its snout, is likely for the best. I’ve included one here for shock value. 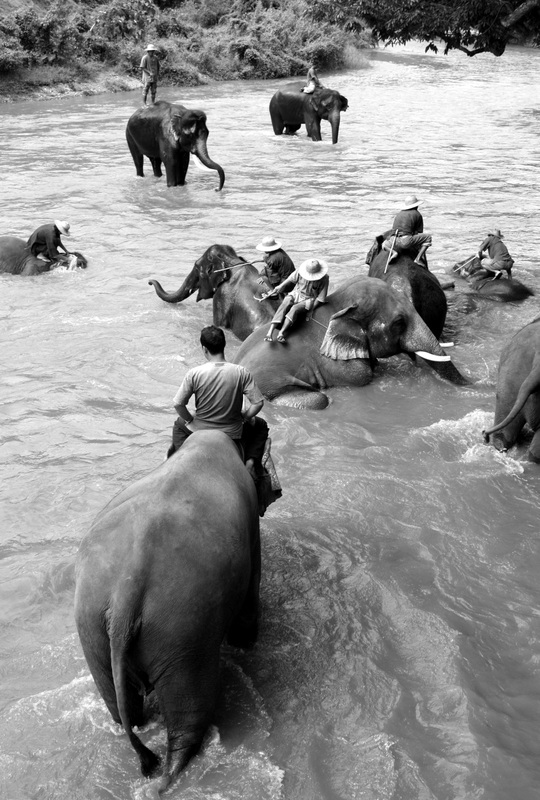 That first experience of elephants was sadly poignant. 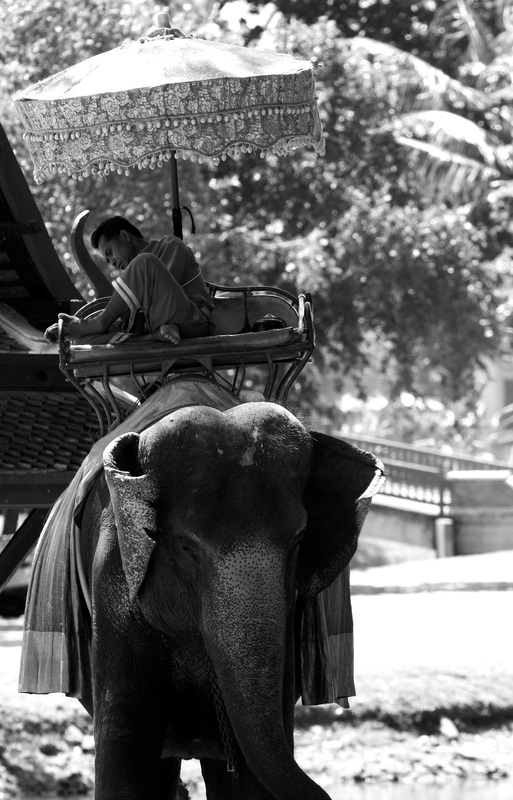 I couldn’t help noticing that one of the elephants was swinging its foreleg bag and forth, and when I asked my father why this was, he told me it was because the elephant was used to being chained – the foot-swinging was habitual on account of its frustration. It was enough to break a small child’s heart. 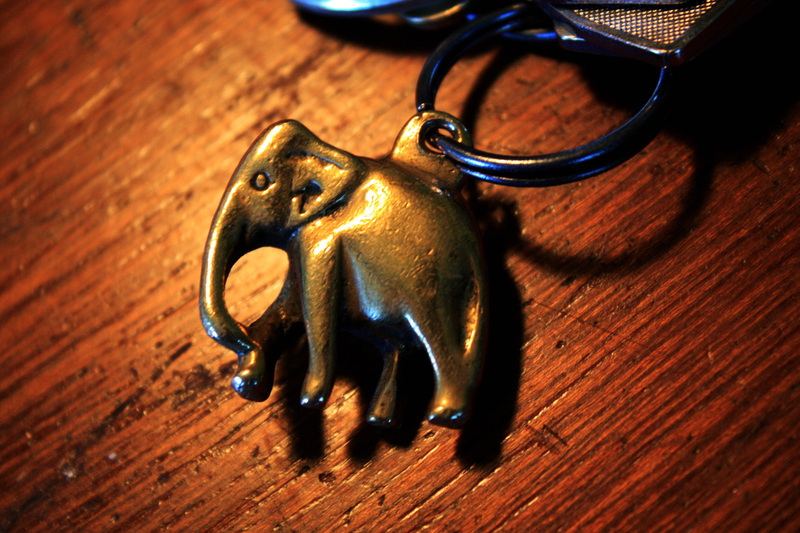 Around the age of seventeen, my mother bought me a brass elephant key-ring. It took about two years before I adopted it, but I haven’t looked back ever since. That elephant key-ring has been everywhere with me in the last twenty years and not only do I dearly love it as my very favourite accessory, but hope to continue using it for the rest of my life. 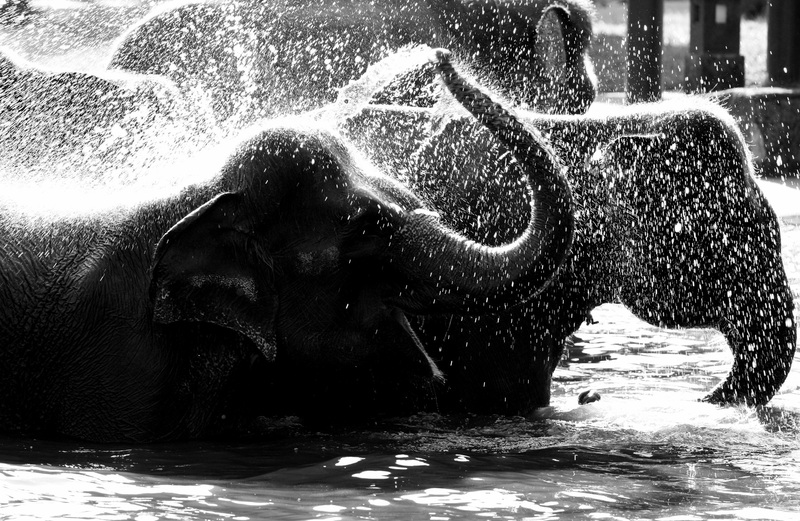 Over the last few years, I’ve been fortunate in being able to see elephants on a number of occasions. 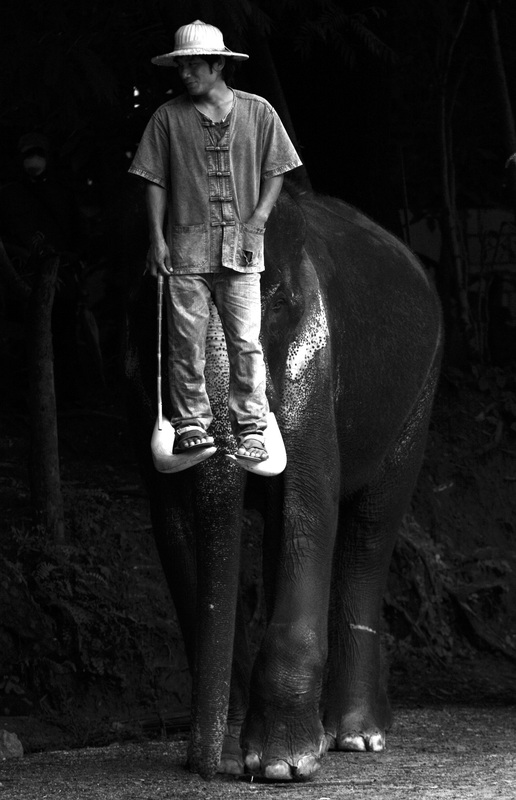 Firstly, when visiting Bali with my brother, during which trip we visited an elephant resort and I took a ride on one of the elephants. 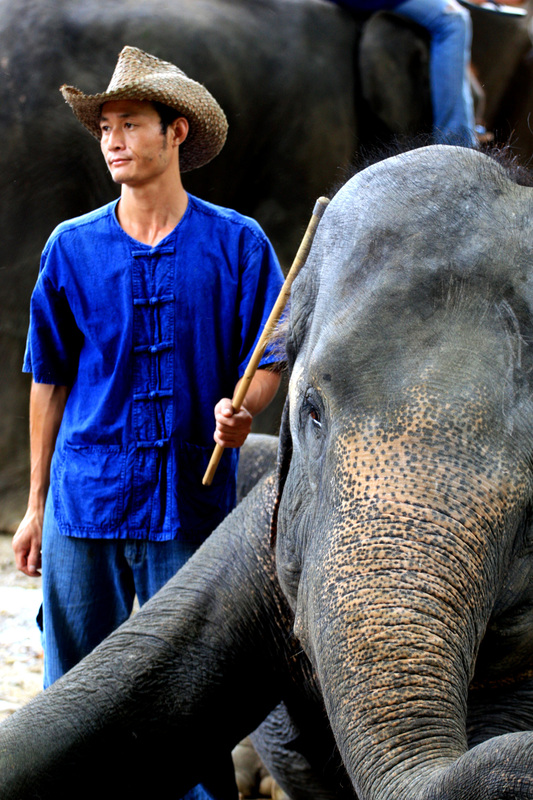 Being able to get so close to so many elephants was wonderful, though I did have many reservations about the way they were handled and kept. 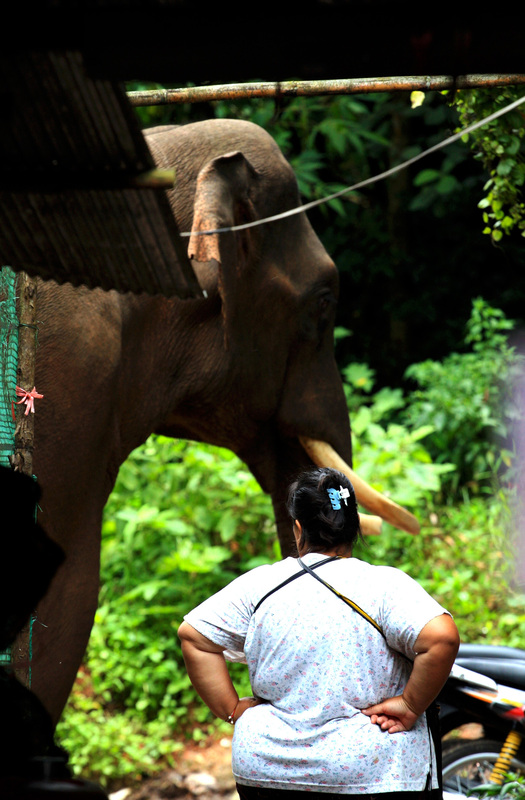 Not that I witnessed or suspected any mistreatment of the elephants, yet these are cultured, social and highly intelligent animals who live in sophisticated extended family groups, and the idea of them being exploited in this way, however pampered they might be, left me feeling like a bit of a hypocrite for supporting the elephant tourism industry. 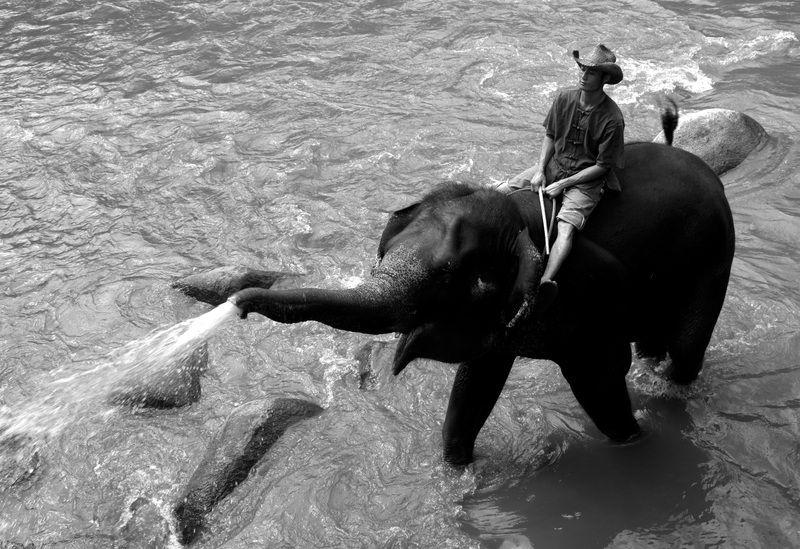 I had similar reservations when I visited an “Elephant School” outside of Chiang Mai in northern Thailand. 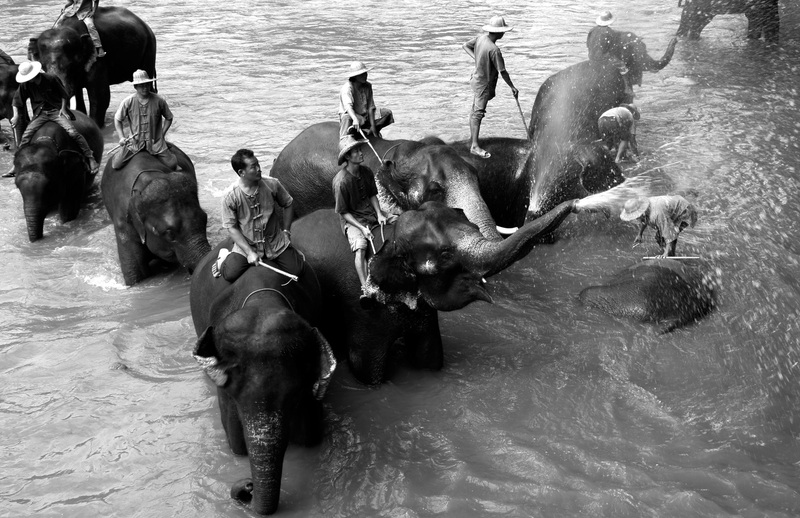 Here at least the elephants had more open, natural terrain around them, including a great river in which they were regularly allowed to wallow and wash. 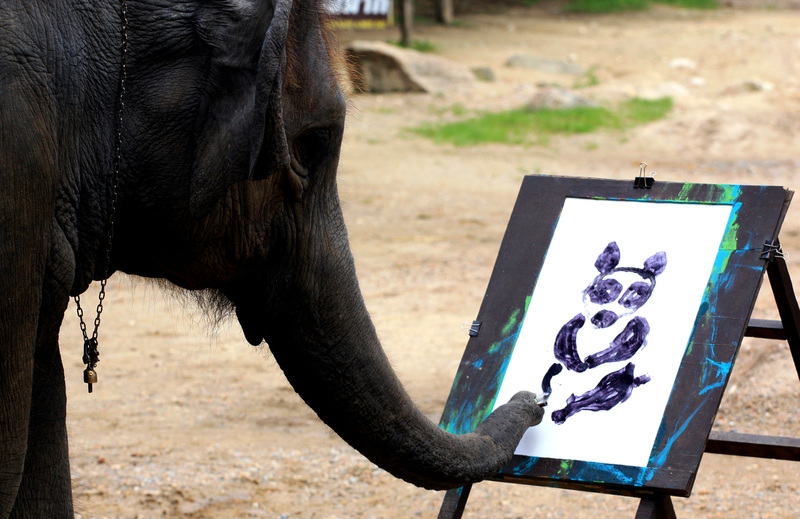 Yet, the elephant talent show, in which they performed tricks, played soccer, lifted logs, sat on their haunches, danced and painted, filled me with such an odd mix of pleasure, pathos and pity that I was conflicted for days afterwards. During the show a young Italian woman was overcome with emotion – seemingly the product of outrage and pity at the humiliating nature of the performance – and cried out in protest. Clutching her face in her hands and shaking her head, she hurriedly fled the scene. Her raw emotion lifted the veil of harmless fun and from thereon the spectacle was coloured with macabre thoughts of the sinister nature of archetypal circuses. 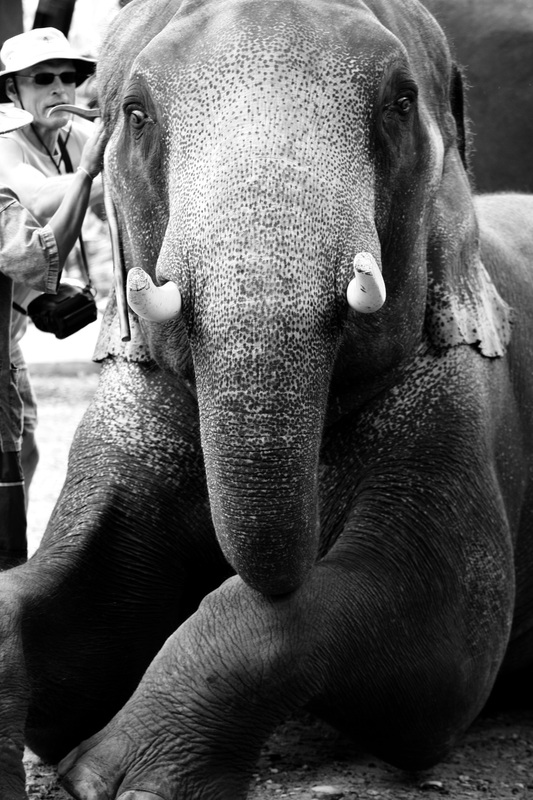 Still, having said that, having come all this way, I retained sufficient excitement at being in such close proximity to so many elephants to busy myself photographing them for several hours. 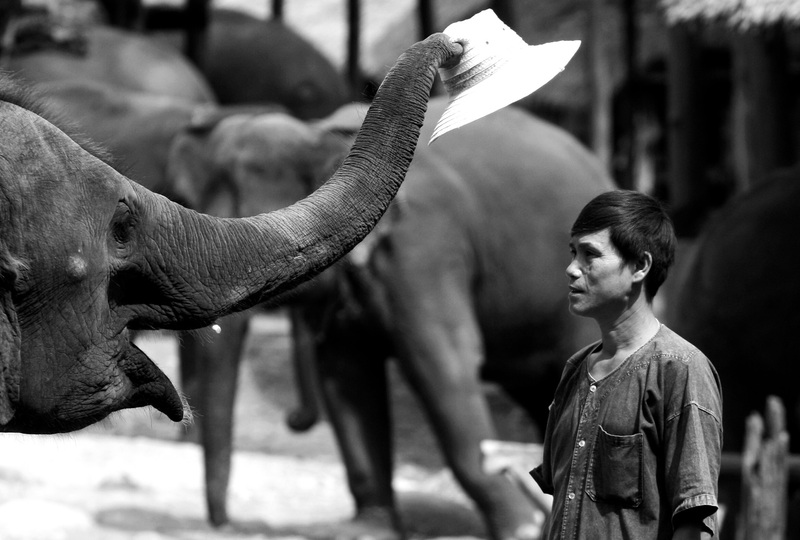 It must be said that the situation of elephants the world over is certainly a sorry one. 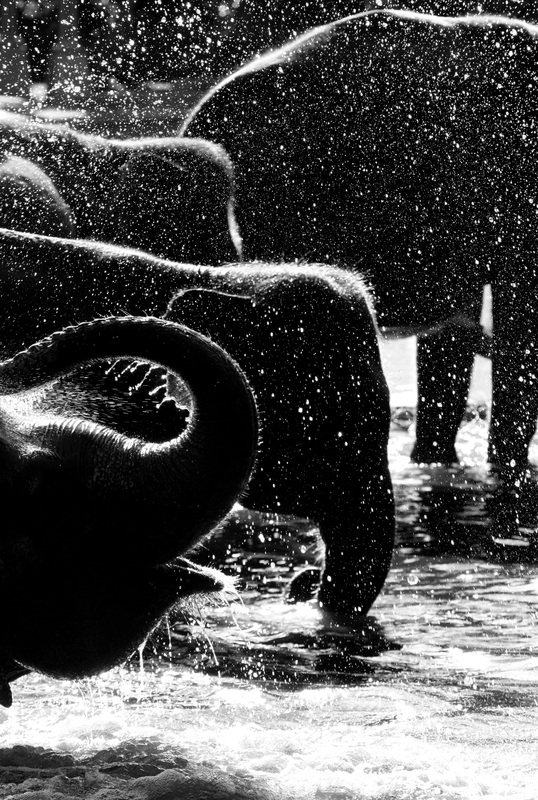 The regular killing of elephants throughout Africa has not only reduced their numbers significantly, but also destroyed the social harmony of elephant communities. 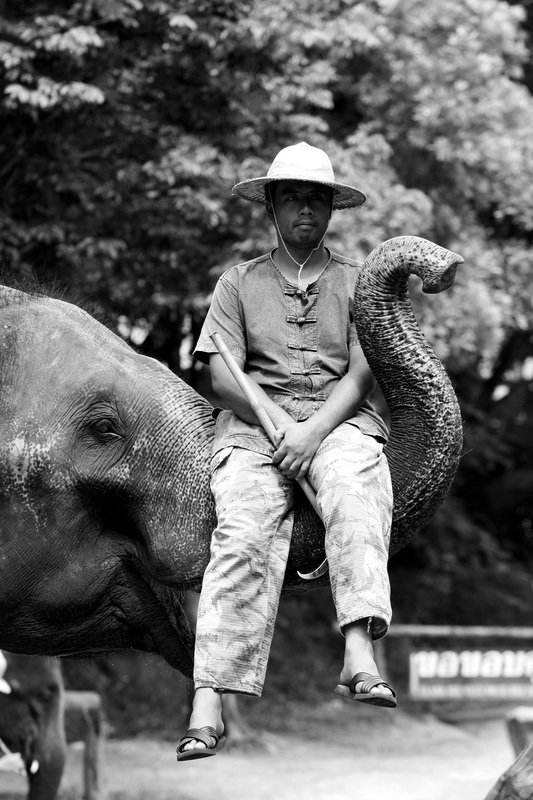 The consequences of this have been, among other things, the animal equivalent of delinquency among young males in particular, who are growing up without the support and structure of a full herd with all its subtleties and complexities. 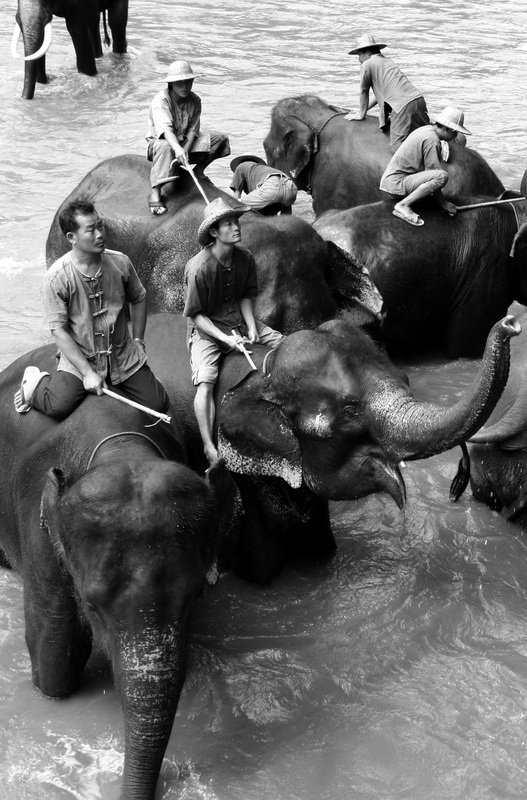 The same could be said of Asian elephants, who are even more on the back-foot than those in Africa. 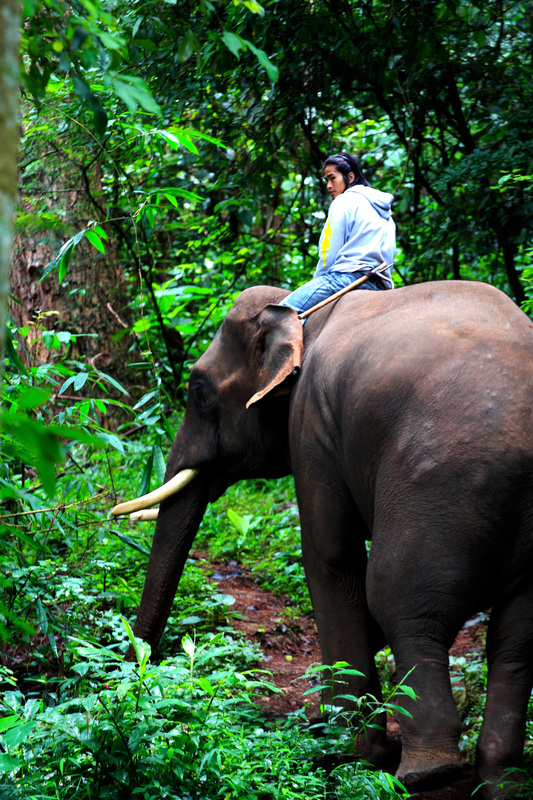 In India, despite much love and respect for elephants, alongside much exploitation of the creatures for work and tourism, those poor beasts remaining in the wild are often forced to compete with humans for habitat and resources, and sadly, humans invariably win these disputes. Without wishing to say a great deal more on this subject, I believe it is time we came to respect the cultures of certain of our mammal cousins by recognising their right both to territory and to an unmolested existence therein. There has been a movement in recent years to extend an animal variant of human rights to marine mammals, to protect their right to life, liberty and the pursuit of happiness. We try, where possible, to respect the still extant primitive human cultures on Earth, though we fail dismally on this front. Surely creatures so sophisticated as to be self aware, have basic language with clear vocabulary, sing songs, talk in their sleep, have local accents and dialects, play with dolls, use tools and pass on culture to their offspring should be regarded in a similar light – as cultures that ought to be respected and protected. Not only should such rights be extended to cetaceans, but also to any other creatures who show similar levels of cultural sophistication. 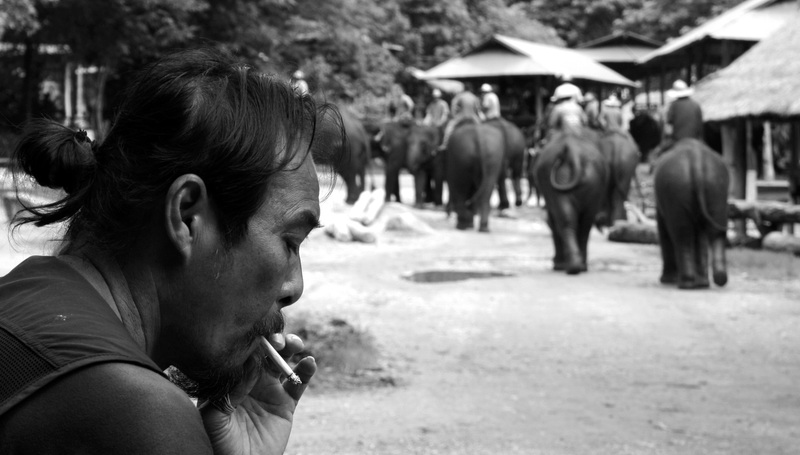 This would of course include all elephant and primate species. I’m not exactly suggesting they should have a seat at the United Nations, though, come to think of it, a representative for the Animal Kingdom might not be such a bad thing after all. 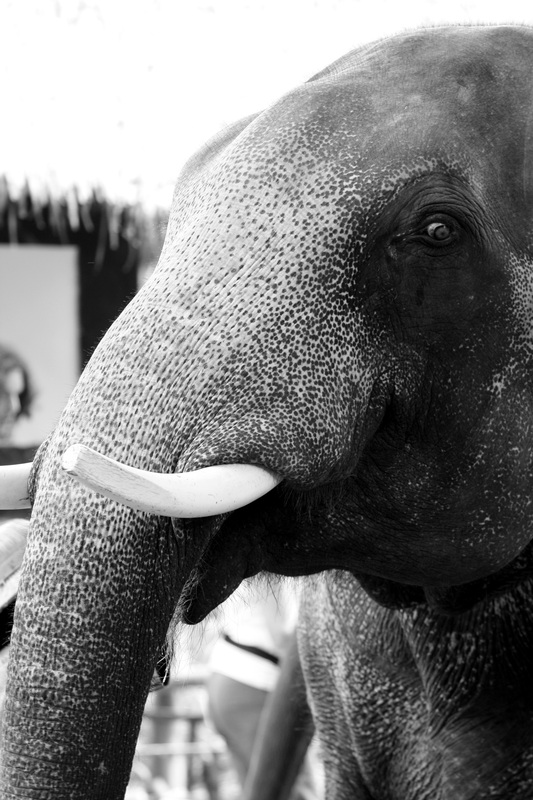 And so, on that note, here are a bunch of elephant photographs I’ve taken in recent years. Great photos! Great stories! And you touch on an important subject of animal rights! !